I saw this tutorial on Splitcoaststampers and had to try it cause it looked like so much fun. Using some scraps I had, I set out to try to quilt.....it was really super easy!!!! 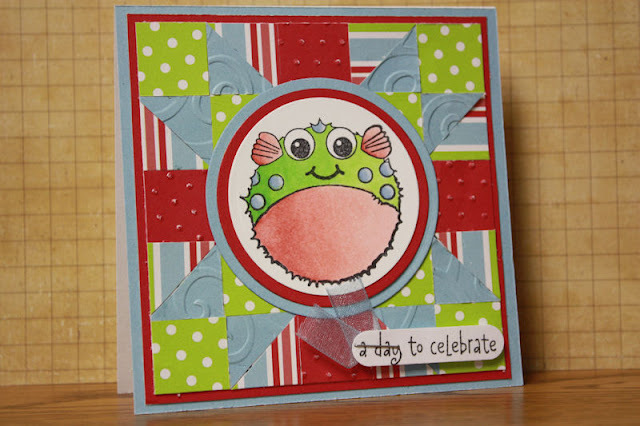 The puffer fish stamp from Imaginisce was colored to match the colors of the 'quilt'. The picture makes it look a little off, but it does match quite nicely. I added a little bit of ribbon, and sentiment and it finished the look of nicely.